Here are some articles and links that could be useful in clinical preventive care. TT is always keen to hear of other information that could be helpful, just get in contact. Widely accepted for its ease of application and effectiveness in managing active dental caries. It’s used as a regular application for individuals, and is being introduce more widely into community based prevention programs particularly for young and preschool children. Its effective in preventing the onset of dental caries, particularly in infants and young kids, if applied regularly ie at least every 6 months, for a minimum 24 month period. Silver fluoride compounds have been used for decades to arrest active dental caries. The silver precipitates into the dentinal tubules and destroys or inactivates bacteria. The fluoride works to remineralise the carious dentine. 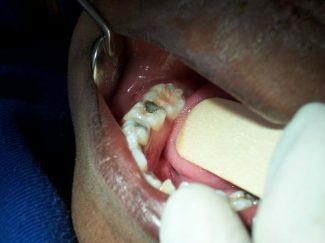 While widely used in child populations mainly on primary teeth, many dentists use it in older patients where conventional filling techniques would fail. 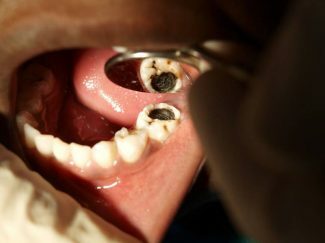 One technique of caries arrestment involves the application of 10% Stannous Fluoride solution as a reducing agent after the AgF, which turns the surface of the lesion black. 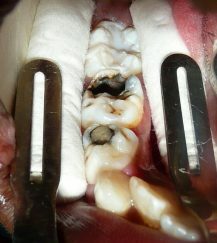 This indicates the caries has been successfully treated ie a visual indicator. See pictures below. Silver diammine fluoride SDF is an AgF solution with ammonia added to help with stability. It has a pH of 13 which could cause a temporary ginvival burn which could be troublesome in older people with more frail gingival tissues. The smell of ammonia could also be offensive particularly to young children. Dr Geoff Knight’s technique of treating and restoring caries with the use of Riva Star (SDF with potassium iodide) can be accessed here. The KI used in this system helps to prevent staining of overlying restorations. This manual, produced by the Centre for Remote Health (Alice Springs) on behalf of the Council for Remote Nurses of Australia (CRANA) is designed as a clinical practice tool for remote area practitioners. The dental section is aimed mostly at non-dental workers, but is also interesting and helpful for dental personnel. Topics include emergency dental care, dental pain management, and the use and application of Fluoride varnish as a decay prevention technique. This guide has been produced for GPs and other health personnel by the Royal Australian College of General Practitioners (RACGP) in conjunction with NACCHO. It’s a guide to best practice in preventive healthcare and a “practical resource intended for all health professionals delivering primary healthcare to Aboriginal and Torres Strait Islander people”. The dental section contains information on early detection and dental screening, prevention recommendations, and some general dental advice. A wealth of articles on many aspects impacting on oral health – individual, community, clinically-based and more. Another wealth of relevant individual and community based articles and documents.